Closet space is like hard to come by real estate. It’s like getting that ocean view or that extra parking space in the garage. For those lucky enough to have that coveted space we love playing up the interiors as if it were its own room, and in some “larger” cases it really is! For those not so large, custom cabinetry can be designed to fit just about anything these days. What I love about designing and decorating a closet is that you can be wildly fun as it truly is your own personal space that is meant for your eyes only. I’ve been happy to hang chandeliers, install custom drapery, mirrors, rugs and get detailed on hardware. Why not? This won’t be a lengthy post as the pictures speak for themselves so just join me in drooling over these post worthy closets, some that I have been lucky enough to design and decorate and others that I just wish I had. custom drapery, ottoman and lighting. The chandelier and sconces worked together to provide enough lighting when needed given the space. 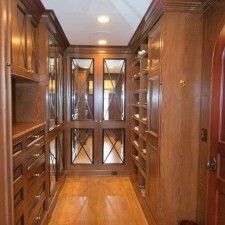 His closet had less space but certainly was impressive and dramatic in dark woods and decorative cabinetry. 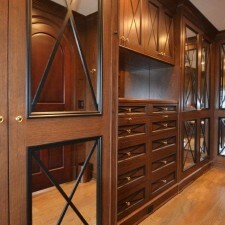 While this closet had length, we added mirrors to the cabinetry to make it appear larger. Pink peony and shoes. What more could a girl ask for in this walk in beauty! Adding your favorite flowers and decorative accessories like picture frames make it more of a dressing room than closet. Making room for the jewelry and accessories is a plus, and custom cabinetry can be designed to fit just about anything big or small. Smart to add the height for boots. with shelving, pull out drawers and hanging rods seems to have been designed to neatly accommodate everything. Okay, found this gem on www.Rockfashion.com. Seriously how many prints can you fit into one space that scream fun! Talk about personality! That artwork and rug is so inspiring too. Even the dog doesn’t want to leave. Sigh…. 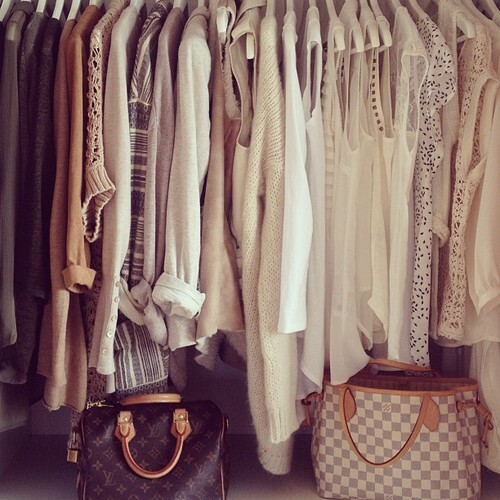 Yup, closet space can be dreamy. If you have the space you just have to add the right touches. I think I need to go rearrange a few things in my own closet now! Previous Post: « Diane’s Paint Post!